Hank can sniff out a great product from a mile away. Having spent the last several years with his nose down here at The Grommet headquarters, he jumped on the chance to finally launch his own discovery, The Stik. Hank knows innovation, especially when it comes to the pet industry. He understands what makes one pet product stand out from the rest and is ready to take a leap, representing all of the four-legged Pet-Entrepreneurs out there. 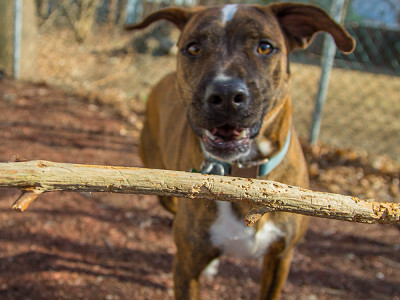 Made in the U.S.,The Stik is Mother Nature’s ultimate form of entertainment for dogs. This toy is 100% made of recycled wood, which is a great fit for pets because it’s natural and nontoxic. Hank knows that The Stik will make any pup out there wag their tail, and we're pretty confident that Hank knows his stuff. Who would second guess a dog in a tie, right? Can you choose size of stick. When will we be able to buy it. My dog is a chewer and 20 lb dashound about how long will a stick last when chewed everyday. 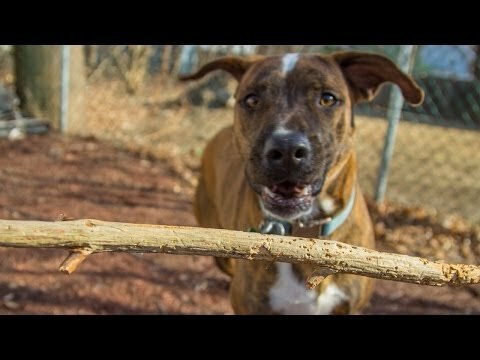 What makes dogs attracted to the stick? @Joan There is an endless possibilities of shapes and sizes you can choose from. Just pick one up in any wooded area near you. Depending on the size of The Stik you choose, your Dashound could go eat through it within an hour to a couple days. Many things attract dogs to The Stik. 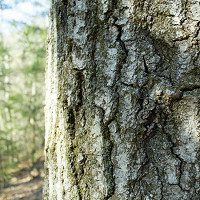 The wooded texture, variety of tastes, woodsy smell...what else can a pooch ask for? @Hank This is great! Hysterical! I actually fell for it! When is the stik available, how long does it last and at what cost? @Shirley The Stik is available right now. Again depending on The Stik and your dog, it could last anywhere from an hour or to days. Do I need to wait until a stick falls to the ground or can I actually snap a stick of choice off of a tree? I think this is ingenious and look forward to rescuing a dog to try out these "sticks" Is there a certain breed or dog you would recommend I rescue or are sticks inherent in your society as stress releases. I would personally recommend waiting until The Stik hits the ground. Mother Earth may not appreciate breaking them off before they are ready. Any breed of dog will appreciate this but I definitely recommend a rescue pup. Feel free to reach out more if you should need some help finding a good rescue organization. I am a bit of a expert in this department. @Hank Yeah? I am thinking these stress stiks would work for humans myself....I'll let you know...just afraid splinters between my teeth! @sandra Hi Sandra, I would definitely not recommend humans chewing on them. Your teeth are not built for the barky goodness. However, you can relieve some stress by going out to wooded areas with your pup and playing fetch. The woods have extreme powers to calm the human mind...or so I hear. Too funny! Happy April Fool's Day! @S L Thanks S L. I am certainly enjoying my moment in the spotlight. Jolly good video...Hank. Your @thegrommet humans fools are quite proud! @joanne I told you I would be perfect for this job, Joanne. We should discuss a new office for me at some point, as I expect I will be the star talent after today's launch. @Hank I like your confidence Hank. You will want my job next. Thanks. Alyssa wanted me to wear the blue one but I told her red was the right choice. My Auntie Anna works at an eye doctor so she styled me well. My eyes are not as strong as they used to be when I was a pup. Hi Hank. All of us here at The Possible Project are quite impressed with your innovative design (and your professionalism). The Stik is sure to be a hit. If you ever want to be a guest speaker for our high school student entrepreneurs, shoot us an email (or throw over a Stik). @Megan Not to toot my own horn...but...I am quite the motivator for young kids. However, I don't do well with large crowds. The Possible Project is an amazing program and I am truly honored that you thought of me. @gail Ohhh yes. Bark is A-M-A-Z-I-N-G! So delicious! This entry has come in through Citizen's Gallery so hopefully we can launch soon. Thanks for your input. After warning my pals that if they kept playing with sticks they could lose an eye, you've now come out with a product that promotes this exact injury. This morning Igor was out romping with his new Stik and suffice it to say he now looks like his name. You'll be hearing from our attorney Mr. Barksdale. I am sorry to hear that you have a moral opposition to The Stik. We certainly do not want to encourage dangerous play, however, the Stik is safe in almost all circumstances. It sounds as if Igor may need some glasses to help ensure safe play with Stiks. I can recommend someone who can hook him up with a great pair of glasses. Either way, I bet Igor is a good-looking fellow and I would love to see some photos of him. Igor and Mr. Barksdale, I think upon further inspection you will find The Grommet to be a top notch place to find the best pet toy. Please look around our site a bit as I am sure you discover something wonderful. Maybe start with Crinket. It is a very safe toy that can be used indoors. Thanks again. @Hank it is not a joke, dogs can die or are seriously injured playing with sticks. Please stop promoting dangerous toys. The Grommet should expect to hear from dog owners who have lost dogs due to playing with sticks. Each year veterinarians across the planet see injured patients. It is not worth it. I emailed your staff but received no reply. I assume you feel a joke is just that, a joke. I sincerely hope your promotion of unsafe play toys as being very safe, does not result in a lawsuit. Shame on you. @Aimee It is amazing to see how animals/pets re-purpose items in the home. Thank you Grommet for the story of Hank. I laughed out loud and that is always a good thing. We are so happy to have brought some joy into your day. 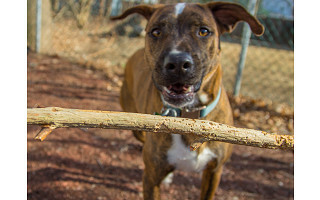 Dogs love The Stik because it connects them to nature. Why do you think we love riding in the car with our heads out the window? So many sights and smells to be experienced. The Stik is perfect for active or lazy pups and can be incorporated into many activities. Aimee, here at The Grommet, we are relentless in our pursuit to make our customers happy. I am thrilled to hear that I have aided in that. Have a fantastic day! This whole launch and conversation just made my day. I keep going back to see all the clever comments, love it! Thanks Hank! @KymNoelle Hello KymNoelle, I am a pretty clever fellow. :) My ears a literally perked with delight in waiting to hear what our community thinks. I have been at The Grommet for about a year and a half now and this is my first launch. Soooo exciting! Please don't advertise dogs to chew on sticks. Very dangerous. Chards of sticks can get caught in their mouths, throat, intestines, stomach, etc. DO NOT let dogs chew on sticks. @Mary Hi Mary, the humans here at The Grommet never encourage any dangerous play but from a dog's point of view....we just love chewing on things. Stiks should always be used under human supervision as to prevent any mishaps. Pet safety is always our top priority. I apologize if my pitch did not state that enough. Sometimes, my puppy instinct takes over. @Hank dogs can die, even with supervision. That is the point. They can bleed to death right in front of their owners. I am done with this farce and this company. Hank here. I just wanted to thank our amazing Grommet community. I am so thankful for all the wonderful support you have showed me during my first launch. As promised, Alyssa is taking me for a nice car ride and a hike. Thanks again! Thanks so much for the smile. Hi Dawn, Stiks come in so many varieties but we always stay away from any with wiry textures or thorns. We prefer smooth ones. Thanks for sharing your story, Dawn! Soo excited to find that The Stik is available in my area! Hank can sniff out a great product from a mile away. Having spent the last several years with his nose down here at The Grommet headquarters, he jumped on the chance to finally launch his own discovery, The Stik. Hank knows innovation, especially when it comes to the pet industry. He understands what makes one pet product stand out from the rest and is ready to take a leap, representing all of the four-legged Pet-Entrepreneurs out there. Made in the U.S.,The Stik is Mother Nature’s ultimate form of entertainment for dogs. This toy is 100% made of recycled wood, which is a great fit for pets because it’s natural and nontoxic.